The Loom Runs. The Smoke Rises is an exhibition of paintings and fabric collages by Dundee artist Nicola Wiltshire. Created during a six-month residency, the works celebrate life inside a thriving North East Scotland factory. The Loom Runs. The Smoke Rises is a series of paintings and fabric collages that celebrate life inside a thriving North East Scotland factory. The paintings take you behind the scenes at Halley Stevensons, who manufacture waxed cotton for clients such as Barbour from the historic Baltic Works factory in Dundee. 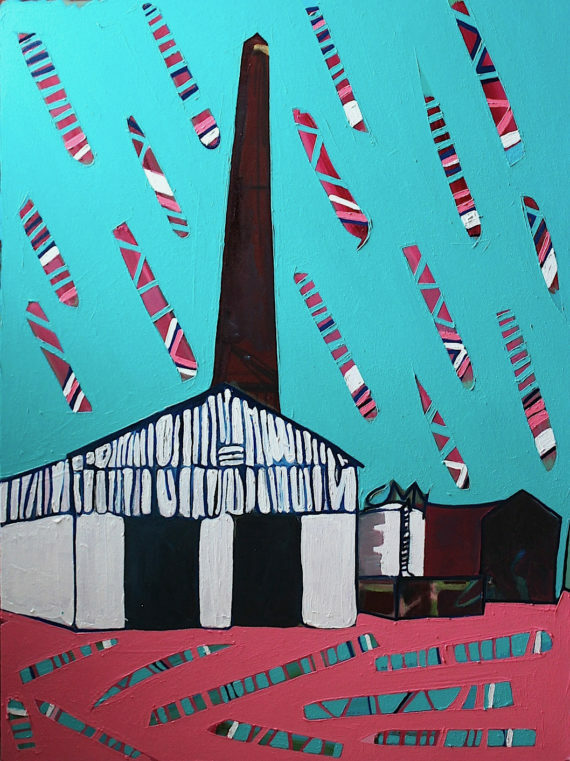 The works were created during a six-month residency at Halley Stevensons and feature people and scenes from the factory painted in Nicolaʼs recognisable bold and colourful style. For six months, Nicola’s studio was an empty office in the middle of the busy factory floor, allowing the real energy of the workplace to penetrate her paintings. The exhibition will feature fifteen works that were created during the 2017 residency, as well as fabric collages, fabric hangings and a selection of new paintings. All the works are created using waxed cotton manufactured by Halley Stevensons. Nicola Wiltshire (b. 1987 Cambridge, UK) completed her BA at University of Westminster, London (2009) and her MFA at Duncan of Jordanstone College of Art and Design, Dundee (2015). The Guardian named Nicola as an “artist to watch” (2017). She has also been described as “one of the most exciting young artists in Britain” by the curator at Hartlepool Art Gallery (2016). Nicola has had solo and group exhibitions throughout England and Scotland, including London and Edinburgh. Her work is included in public and private collections in UK, Europe, Australia and USA. British painter. Born in Cambridge, living and working in Dundee.